NASA's Cassini imaging scientists processed this view of Saturn's moon Hyperion, taken during a close flyby on May 31, 2015. This flyby marks the mission's final close approach to Saturn's largest irregularly shaped moon, upholding the moon's reputation as one of the most bizarre objects in the solar system. 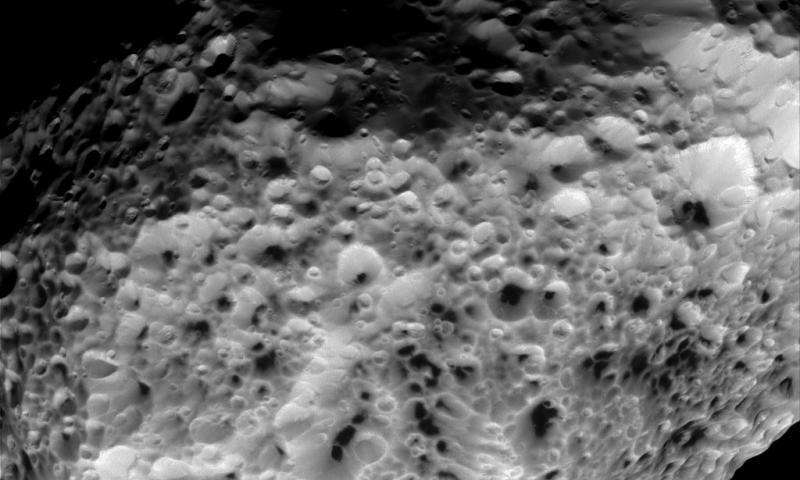 The views show Hyperion's deeply impact-scarred surface, with many craters displaying dark material on their floors. During this flyby, Cassini passed Hyperion at a distance of about 21,000 miles (34,000 kilometers) at closest approach. 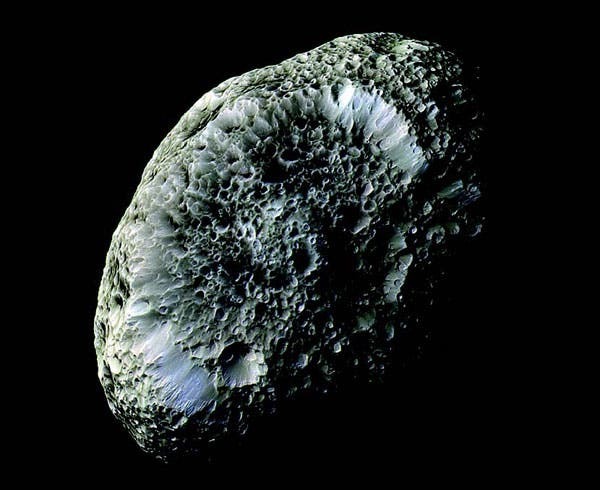 Hyperion is the largest of Saturn's irregular, or potato-shaped, moons and may be the remnant of a violent collision that shattered a larger object into pieces. Cassini scientists attribute Hyperion's peculiar, sponge-like appearance to the fact that it has an unusually low density for such a large object — about half that of water. Its low density indicates Hyperion is quite porous, with weak surface gravity. These characteristics mean impactors tend to compress the surface, rather than excavating it, and most material that is blown off the surface never returns. The Cassini-Huygens mission is a cooperative project of NASA, ESA (European Space Agency) and the Italian Space Agency. NASA's Jet Propulsion Laboratory in Pasadena, California, manages the mission for the agency's Science Mission Directorate in Washington. The Cassini imaging operations center is based at the Space Science Institute in Boulder, Colorado. The California Institute of Technology in Pasadena manages JPL for NASA.